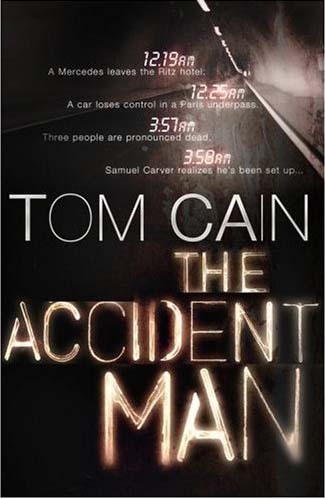 One can see from the first page that ACCIDENT MAN, by the pseudonymous Tom Cain, is one of those "granite-faced assassin" thrillers, with toffee-nosed foreign-office bosses, evil Russians on motorbikes, lovingly described machine-gun makes, triple crosses, and so on. Not only that, but the cover makes it clear that it is that book - the one about Princess Diana and how she really died in that car crash. Although I'm not remotely interested in the British Royal Family, and the opening of the book is pretty cliched, the writing is good, the story soon kicks in, and I was hooked. The first big event is the car crash - thankfully, events are described sparely, quickly and are soon over; it is certainly compelling to observe them from the unique perspective of the assassins. Where the real world has been and is (a court case is going on as I write this review, ten years later) focused on whether the crash was an accident, the book's premise is to treat the reader as an insider, assume it was not, and then depict events immediately after the event from the perspective of the putative killers - who do not know who was in the car, so the author provides some nice touches: the attempted escape by the perpetrators in parallel with their realisation of what they have done. In addition to the basic premise, there are complications in the form of a rival pair of assassins, one of whom may have defected from one group to the other, and who are out to destroy each other. It is not clear which of several organisations set up these crimes, but it is clear that after doing their job in Paris, the killers are now superfluous, and need to be removed. Samuel Carver, the hero, the inevitable orphaned, ex-boarding school, ex-army loner, has to operate on his wits, one step ahead of certain disaster from all manner of quarters. There are several government departments, security departments and even the shadowy Bildberberg group involved, either in the set up, the cover up, or in taking advantage of the chaos that has ensued since the crash. There is love interest, jealousy, loyalty, betrayal and passion between individuals. Vignettes about other situations tangential to the plot tell mini-stories within the main story, a nice touch. The excitement works on various levels - "will they get away? ", "who set them up and why? ", "if they get away, how are they going to ensure their safety? ", and more. The author keeps plenty of balls in the air, breezily cross-cutting between countries and characters with aplomb, and not letting the pace slacken for an instant: as soon as one situation calms down, there are plenty of other strands that can be tautened. Yes, Samuel does have convenient friends who can hack into password-protected computers and set up a perfect sting with cameras in cigarette packets, but this is not over-done. Eventually, after many perilous situations, Samuel gets to London and confronts the various organisations involved in the crime, tenaciously sorting out who ordered what and why - and it all hangs together pretty well for a fiction plot. But then Samuel decides to return to Switzerland to rescue his partner, who has been kidnapped by the rival assassins. Or is this the case? Unfortunately, the book here takes a dive: the last few chapters are taken up with sub-James Bond scenes of torture, Blofield-like villains, explosions and more torture. This is a real let-down after the build-up and chase in the first three-quarters of the book. ACCIDENT MAN would make an escapist read for a journey, but it isn't as good as Lee Child's Jack Reacher series, Peter Temple's IN THE EVIL DAY or John Le Carre's THE LITTLE DRUMMER GIRL.